Jones grew up in Utah and graduated from Juan Diego Catholic High School. He has played hockey since he was in first grade. Jones loves playing in front of the huge Utah crowds, and has great memories growing up in cold rinks filled with friends and family. He is a Senior at the University of Utah pursuant of a degree in Strategic Communication. His hope is to get a job in sports public relations when he is finished with college. In his free time he enjoys spending time at his parent’s house on Sunday’s and relaxing while watching our Lord and Savior Russell Wilson and the rest of the Seahawks play football. 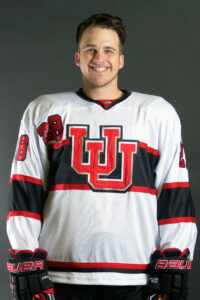 I am incredibly blessed and thankful to be apart of The University of Utah’s Hockey team.